Tamarind | Infonet Biovision Home. Geographical Distribution of Tamarind in Africa, Source ICRAF. Updated on 26th March 2019. Indigenous to tropical Africa; widely used in the Sahel, India, South East Asia, the Caribbean and Central America. A very adaptable species, drought hardy, preferring semi-arid areas and wooded grasslands, tolerating salty, coastal winds, even monsoon climates. It grows in Burkina Faso, Cameroon, Central Africa Republic, Chad, Ethiopia, Gambia, Guinea, Guinea-Bissau, Kenya, Madagascar, Mali, Niger, Nigeria, Senegal, Sudan, Tanzania and Uganda. Farmers commonly cultivate it in parklands in the arid and semiarid zones of West Africa (Kalinganire et al.). A large tree to 30 m, with an extensive dense crown. The short bole can be 1 m in diameter. Evergreen or deciduous in dry areas. Leaves: Compound, on hairy stalks to 15 cm, 10-18 pairs of leaflets, dull green to 3 cm, oblong, round at the tip and base, veins raised. Young leaves ans very young seedlings and flowers are cooked and eaten as greens and in curries in India. In Zimbabwe, the leaves are added to soup and the flowers are an ingredient in salads. Flowers: Small, in few-flowered heads, buds red, petals gold with red veins. The fruit is edible and can also be used as a sort of spice to be added to food. Fruit: Pale brown, sausage-like, hairy pods, cracking when mature to show sticky brown pulp around 1-10 dark brown angular seeds. Firewood, charcoal, timber (furniture, boats, general purposes), poles, food (fruit pulp for drink, fruit, spice), medicine (bark, leaves, roots, fruit), fodder (leaves, fruit), shade, ornamental, mulch, nitrogen fixation, windbreak, tannin (bark), dye and veterinary medicine. Seedlings, wildings, direct sowing at site, grafting and budding for best varieties. The tamarind becomes a fairly large tree, so keep this in mind when planting the tree. It should be planted in full sun. It is highly wind-resistant with strong, supple branches. 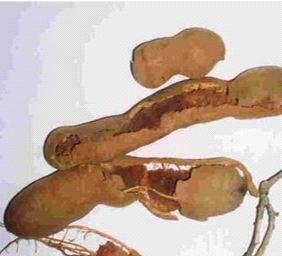 Tamarind may be propagated from seeds, and vegetatively by marcotting (air layering), grafting and budding. Rootsstocks are propagated from seed, which germinate within a week. Seeds retain their viability for several months if kept dry. Plant seeds 1 to 1.5cm deep in containers. Seeds should be selected from viable trees with good production and quality. Germination is best when seeds are covered by 1.5 cm loose, sandy loam or by a mixture of loam and sand. Seedlings should attain at least 80 cm before being transplanted to their final location at the beginning of the rainy season. Seedlings should begin to produce fruit in 6 to 8 years. Food; it has many edible products - flour from seeds may be made into cake and bread, roasted seeds can be matched to groundnuts, fruit is eaten ripe and tamarind juice is just super. The pulp can also be used for souring porridge, drink, seasoning and flavoring. Fuel; is a source of firewood and charcoal for cooking. Medicine; leaves, twigs, bark and roots are used for medicinal purposes. 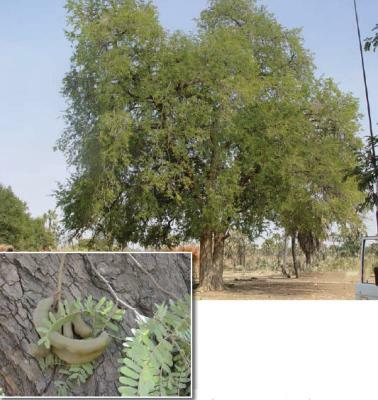 Shade or shelter: The extended crown of the tamarind offers shade so that it is used as a place for holding barazas. Due to its resistance to storms, it can also be used as a windbreak. It should be noted that this tree species is not compatible with other plants because of its dense shade, broad spreading crown and allelopathic effects. Boundary or barrier or support: T. indica can be used as a live fence. Ornamental: The evergreen nature and the beautiful flowers make it suitable for ornamental planting in parks, along roads and riverbanks. Slow growing but long lived. Pollarding, coppicing. 350 - 1,400 seeds per kg. Germination rate around 90%. 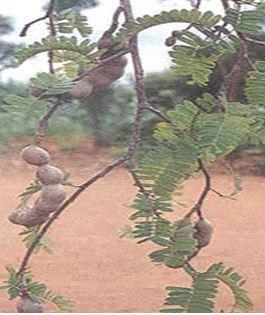 Tamarind seeds have been used in a limited way as emergency food. They are roasted, soaked to remove the seedcoat, then boiled or fried, or ground to a flour or starch (Morton, 1987). Nick or soak seed in cold water for 12 hours. Seed can be stored for more than two years if kept in a dry, cool and insect-free place, because seeds are susceptible to attack by weevils. Young trees are pruned to allow three to five well spaced branches to develop into the main scaffold structure of the tree. Maintenance pruning only is required after that to remove dead or damaged wood (CRFG). The dark brown heartwood is hard and heavy, well grained and easy to polish. The fruit pulp is rich in vitamin C. The fruit has many uses and important for nutrition in many parts of the world, including India. 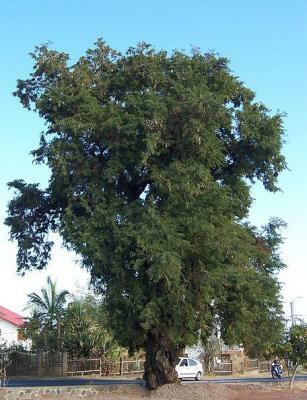 It is budded and grafted on a large scale in the Philippines. Recommended for homesteads. 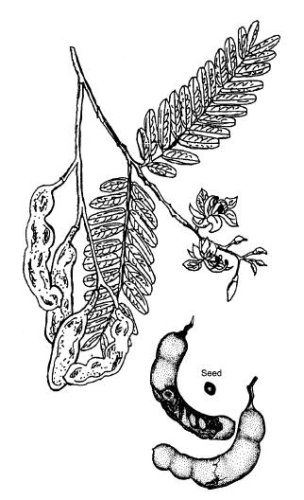 Scale insects; (Aonidiella orientalis, Aspidiotus destructor and Saisetia oleae), mealy-bugs (Nipaecoccus viridis and Planococcus lilacinus), and a borer (Pachymerus gonagra) are the most serious pests of the tamarind. The minor ones include; lac insects, and bagworms. Beetle larvae may attack and damage tree branches as seen in Brazil, while in Florida and Hawaii beetles attack ripe pods. In China termites have been seen to attack the tree. Larvae of the groundnut bruchid beetle are serious pests that attack the fruit and seed an in some seasons, fruit borers may inflict serious damage to maturing fruits causing a great reduction in marketable yields. Diseases which have been reported are leaf spot, powdery mildews, a sooty mould, stem disease, stem, root and wood rot, stem canker, a bark parasite and a bacterial leaf-spot.